I was first drawn to read Somewhere in France after reading a description of it. Set during World War I, the novel is about a young woman, Lady Elizabeth, who wants to do her part in the war. Her mother forbids it, wanting her daughter to marry well and raise a family, true to the family's station in life. Elizabeth, or Lily as she prefers to be called, grew up around opulence and wealth, but she has always aspired to be something more than just her title allows. Encouraged by her former tutor and friend, Charlotte, as well as by her brother's best friend, Robbie, Lily leaves home and ventures out on her own. Lily is humble and modest. She has the grace of the lady she is, and is curious and eager to take on the world. I liked her instantly and appreciated how much she cared for people. I understood and could relate to her hesitancy when it came to taking those big steps, which was more from nerves and uncertainty than anything else. Lily was naive in many respects, but she was also smart and resourceful. She was not afraid to get her hands dirty and learn something new. Lily tries to hide her family roots once she enters the "real world", taking a job first as a painter and then as a "Clippie" (female conductor on a bus). When the opportunity comes to actually take part in the war effort more directly, Lily takes a job as an ambulance driver by joining the Women's Army Auxiliary Corps (WAAC). She is assigned to work in France, where she works alongside her brother's best friend Robbie, a surgeon. Like Lily, I was immediately taken with Robbie. His background is not one Lily's mother thinks highly of, although Robbie is the sort of man I think any mother should be proud of. He is hard working and thoughtful. He sees in Lily what she doesn't see in herself at first, helping her find the courage she needs to be who she wants to be. Somewhere in France is very much a love story, with Lily and Robbie at its heart. Forbidden love tends to make a compelling story, and this instance was no different. Lily and Robbie have real chemistry, and I wanted nothing more than for them to be able to be together, despite the odds. The war itself plays an integral part to the story. Many were excited when war was declared, but the horrors of what was to come, the lives lost and the trauma suffered, soon brought everyone back to reality. War is not at all pretty. Jennifer Robson does a good job of capturing the affects of war on the men and women directly and indirectly involved in the fight. Not everyone reacts the same way, and I really appreciated the different perspectives the author provides. In particular, Lily's brother, Edward, comes to mind. None of the characters were left untouched by the war, and by the end, each had grown has individuals. 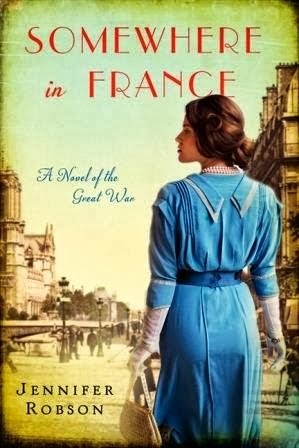 Somewhere in France was an enjoyable book to read, full of heart and yet also bittersweet at times. I will definitely be reading more by this author in the future. To learn more about Jennifer Robson and her books, please visit the author's Facebook Page. I hope you will check out what others had to say about Somewhere in France on the TLC Book Tours route! Many thanks to the TLC Book Tours for the opportunity to be a part of this book tour. The publisher provided an e-copy of the book for review. Sounds like the perfect book for when you are cuddled up on a cold day! I'm not keen on romances but do enjoy a good love story. The backdrop of the war makes it sound really good. Kathy - I tend to prefer (although not always) my romance on the side rather than as the main focus, but this book had enough other stuff going on to balance it out. For me anyway. Not a big fan of historical however I just finished one that I have been musing over befre finishing up my review. Thanks for sharing your thoughts. I am your newest follower. I love the pictures of your furbabies and the overall theme over here, I will be back. I always keep saying I don't like war settings but in reality I love reading about the women and how they survived/overcame those difficult times. And, as this one has a love story well, I think I need to add this to my list! Iliana - You might enjoy this one despite the war setting. I hope you do if you read it, at least! I enjoy historical novels and novels that deal with the effects of war on a society. Thanks for the review! Jenclair - I do too. I liked that this novel touched on that. In some respects, I think that is what made this book more than just a "light" romantic tale, if you will. I'm looking forward to falling in love with Lily and Robbie's story ... this is definitely my kind of book! Heather - Thanks! I hope you enjoy it if you read it. I'd love to be somewhere in France right now. This looks like one I'd like. Stacy - I can imagine! Especially with the weather you've been having. Both the time period and geographic setting appeal to me, so this looks like one for the TBR pile! Teresa - I think you would really like it, Teresa! War and love stories seem to go together a lot in literature but are such a tough balancing act. Glad this one succeeds! Lisa - They certainly can be. I think Jennifer Robson does a good job of balancing both. Glad to see you realky liked it, too. Both the romance and the war were so well done. Anna - Yes, I thought so too!